Forgot to post this from last month. But basically the same outfit as always. Love it! Rock/chic NEVER leaves my top list, no matter what walks down the runway. Hurray for the return of the destroyed pant! Kudos. You look so rad. Love the leather jacket and the ripped jeans. I'm having a moment for ripped jeans at the moment, need a neck tie! yes yes yes - love this. split knee jeans are so freaking comfy! love this outfit, so basic and cool. I"d bee crazy to wear something like this in the spring where I am from, I'd get a heat stroke. But looks wicked on you! Ugh this is love. You are amazing. 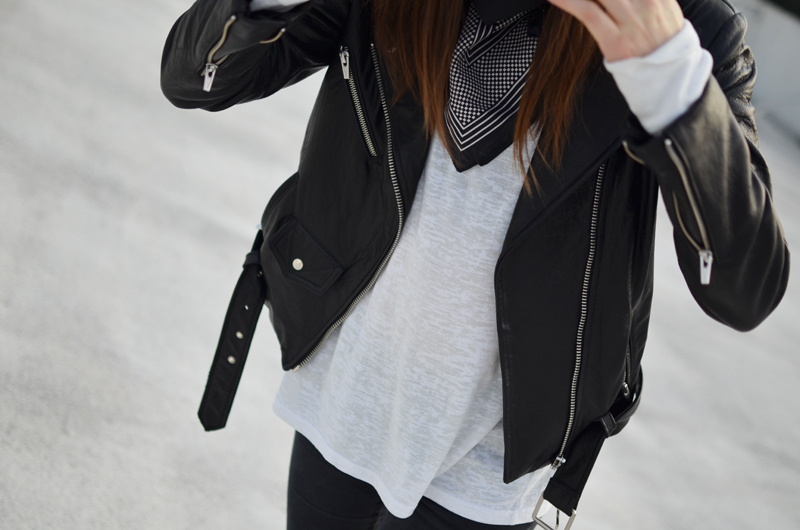 Love leather and black denim! Love this look for casual and hangout events.